These days it seems like everyone is talking about suspension systems in power wheelchairs. Suspension is not a specification that can simply be checked off a list of features as present or absent. A flashy name or brightly colored shock is not a guarantee of true vibration reduction or improved performance on uneven terrain. Suspension is actually made up of multiple components such as chassis stability, springs, tires, and the amount of moving parts. Evaluating the effectiveness of a suspension system is a critical, but often misunderstood part of the wheelchair selection process. Permobil power wheelchairs feature adjustable suspension systems designed with a focus on optimizing rider comfort and chair performance. 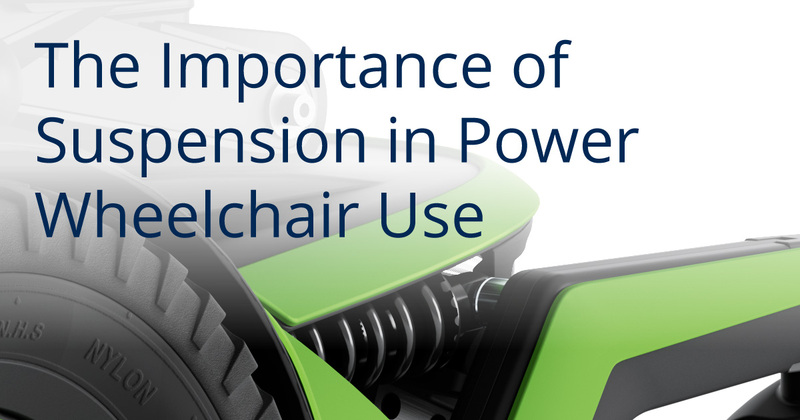 In today’s blog we will further discuss some key concepts related to power wheelchair suspension systems. In a survey completed by Patients Like Me, the top two requests for power wheelchair characteristics were improved drivability on rough surfaces and improved comfort3. Both these requests can be addressed through the suspension system of a wheelchair, as research has shown an increased risk of spinal damage associated with vibration forces transferred directly through the seating system to the wheelchair user's spine1. High levels of vibration have been shown to have a negative effect on posture increasing risk for deformities, pain and musculoskeletal disorders2. Wheelchair users may also be more sensitive to vibration related to other factors such as increased tone and fatigue. Vibration forces can lead to a loss of position over the course of the day making wheelchair mobility more difficult and result in an increased risk for tissue breakdown. Minimizing the exposure to vibrations is important to promoting a power wheelchair user’s overall health, enhancing functional endurance and quality of life. Wheelchair suspension needs to provide three things: comfort, stability and traction. Comfort to reduce the forces that impact the wheelchair user and contribute to loss of position, discomfort or fatigue. In more technical terms, you could say that the suspension aims to isolate the seating structure from vibrations generated along the driving surface. Decreasing forces transmitted to the user can help increase sitting tolerance, aid in pain management and preserve energy to accomplish daily tasks. Stability to help a person feel safe and confident driving the wheelchair over a variety of terrain and surfaces. 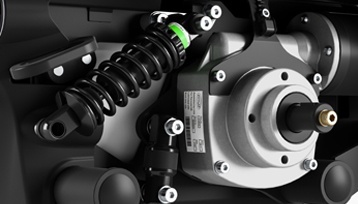 Suspension aims not only to keep the base stable negotiating obstacles, but also to aid the user in maintaining balance for safe handling of drive controls during braking, accelerating and turning. Traction to allow the wheelchair to be driven over a wide variety of surfaces, including curb cuts and ramps, reducing the risk of high centering or getting stuck which promotes greater wheelchair user independence in home and community mobility. Permobil power wheelchairs have incorporated high quality suspension for many years so optimizing comfort, stability, and traction has long been part of our mindset. Our engineers continue to apply modern and advanced suspensions in the design of our wheelchairs. This increased focus on suspension performance has a significant impact on the design and manufacturing methods of the wheelchair, especially, but not exclusively, the chassis. Critical parameters to be considered are geometry, structural rigidity and stiffness, reliability and durability, and robustness to promote a suspension system that works for all user weights, at all drive speeds, and in a variety of seating positions. Put simply, not all suspension systems are created equal. While a brightly colored spring or shock may call attention to the presence of suspension, the effectiveness is determined by the design and quality of the system. Permobil is committed to providing an enhanced ride quality and driving experience for our users. 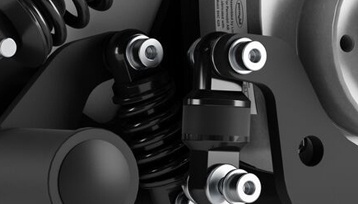 We offer adjustable suspension systems that work in all drive positions, so you never have to go without it. Permobil power wheelchairs also allow fine tuning for individual variables such as user weight changes and environment. Our engineers focus not simply on having suspension, but on the quality and type of suspension provided. Attention is also given to reducing the overall number of components that require additional maintenance. Ensuring the correct location and type of springs/shocks in the chassis is essential to promoting effective vibration reduction and optimal performance of the wheelchair. Our F Series front wheel drive models feature all wheel fully independent suspension that can be easily adjusted while user is seated in the chair. 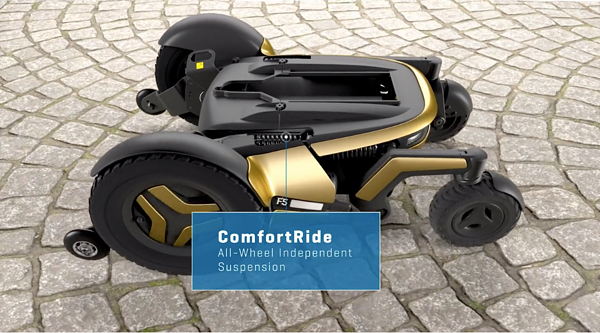 ComfortRide suspension on the F3 Corpus allows all wheels to move freely and independently for a smooth, comfortable and stable ride. 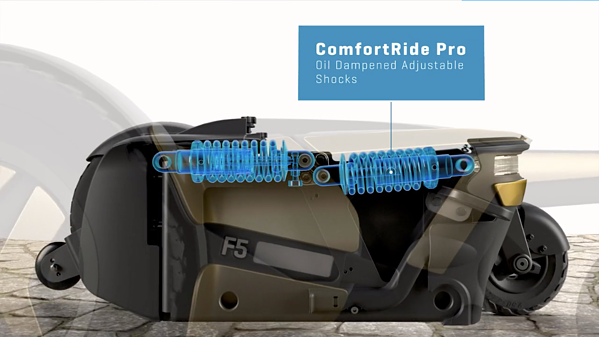 ComfortRide Pro on the F5 Corpus provides even greater vibration isolation with the addition of oil-dampened shocks to offer unparalleled ride comfort and drive performance. Next time you trial a power wheelchair, ask about suspension. It’s a key component to providing your client with the optimal equipment they need for function and comfort. 1. Sullivan, A. and McGill, S. (1990). Changes in Spine Length During and After Seated Whole-Body Vibration. Spine, 15, pp.1257-1260. 2. Garcia-Mendez et al (2013). Health Risks of Vibration Exposure to Wheelchair Users in the Community. Journal of Spinal Cord Medicine, 36(4), pp.365-375. 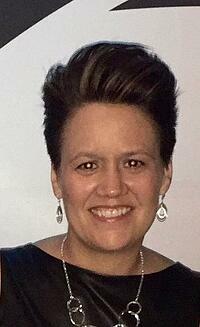 Melissa has been involved in wheelchair seating and equipment provision for over 20 years. She began her career as an Occupational Therapist at Spaulding Rehabilitation Hospital in Boston, MA. Melissa later transitioned to the Veteran’s Administration (VA) Medical Center in West Roxbury, Massachusetts. There she worked in inpatient and outpatient rehab eventually becoming Senior OT on the Spinal Cord Injury unit and running the Wheelchair Clinic. She has presented nationally and internationally on topics related to seating, mobility and adaptive equipment throughout her career. Melissa has worked as a clinician, dealer provider, and manufacturer’s representative affording her a variety of experiences and perspectives on the industry. Melissa joined Permobil in 2007 as the territory sales manager for northern New England before relocating to San Francisco in 2015 to represent Permobil in the Bay Area. In July of 2017, Melissa began a new chapter in her career assuming responsibility for market development of Permobil power products in North and South America.